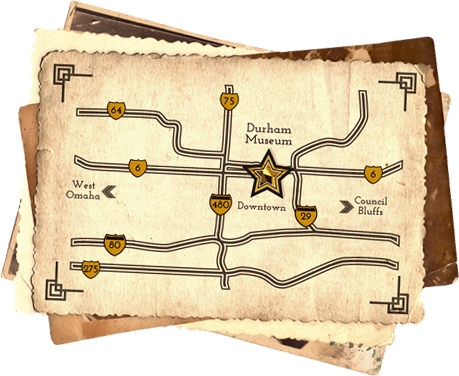 The Durham Museum collects items pertaining to the history of the greater Omaha area and the role it has played in the development of the United States. The collection contains objects, ranging from photos to phone booths, coins to clarinets and even a pocket watch rescued from the Titanic! Rare books, documents, certificates, maps, letters documenting important events that occurred in Omaha such as the Trans-Mississippi Exhibition of 1898, and the Golden Spike Days celebration of 1939. The collection also contains the history of important organizations like the Knights of Ak-Sar-Ben Foundation. Almost 10,000 objects compiled by Omaha real estate agent Byron Reed, during the late 19th century, containing coins, banknotes, documents, books and maps. Decorative arts, textiles, tools, ephemera; many of these items were commonplace during their day, but today are rarely seen outside of a museum. The Photo Archive contains over 1 million images that document the fascinating history of Omaha from its early days as a young frontier town to a unique and sophisticated city. I am interested in donating to the Museum Collection.